The Sole F83 treadmill is rated by consumers and fitness expert as one of the best treadmills on the market. The F83 treadmill is one of the top three best fold up treadmills; Treadmill Doctor rated the F83 as runner up in the category for the best fold up treadmill. The Sole F83 is what divides F80 and F85; quality, point of view and price. F83 models offer more than the F80 but less than the F85. If you want a longer deck than the Sole F80, but less of a power motor than the F85, then the F83 might be the right treadmill for you. Is the F83 suitable for home treadmill training? If you ever wanted to train on a steady, powerful, high quality, full of featured programs and affordable treadmill, then the Sole F83 might be the right treadmill for you. A F83 Sole treadmill is very powerful and boasts a 3.0 horsepower, continuous duty motor, which delivers a multiple speed range of 0.1 to 12 miles per hour, and inclines of up to 15 percent. If you are a big fan of technology, such as a LED Display message board for clear instruction and feedback, tracking your time, incline percentage, calorie, speed, distance traveled, pulse and pace; then this treadmill is a good choice. When you step up into the $1,700 price range with Sole, things start to feel a lot more like club treadmill quality. They are outfitted with a host of additional user friendly features, that many treadmills within the same price range don’t have. The Sole F83 treadmill is like treadmill at the clubs, gyms and hotels; it contains the same features and high quality as those treadmills, if not better. The F83 sole treadmill has six fat-burning workout programs, two custom programs, and two heart rate control programs for cardio workouts or weight loss. If you have bad knees or sensitive joints, you will love the cushion flex treadmill deck. The Sole F83 is built to protect your knees from excessive pounding, reducing impact of up to 40%, compared to running outdoors. F83 treadmills are built with a ¼ track feature, which follows your running and records it onto a graph that corresponds to individual programs. Having the ability to track your progress is like having a personal trainer, but free of charge. When you are not using the treadmill, you don’t have to worry about protecting it from dust. It folds into a compact footprint and locks securely in place, saving space. 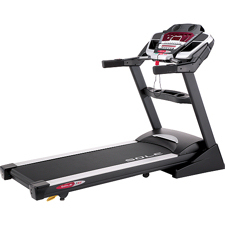 It is hard to find weak points for any Sole treadmills and the F83 is not any different. Most consumers find it very heavy to lift the treadmill, so if you are thinking of moving the treadmill on a regular basis, then be warned; this treadmill is heavy and you are better off leaving it in one place. Most consumers rated the Sole F83 from a 4 to 4.5 (out of 5), because of the ability to workout on a sturdy, quiet and powerful treadmill. Featured programs are customer pleasers, such as endurance training, heart rate training, performance training and weight loss programs. The majority of customers were impressed with the overall construction and design of the F83. The ability to change speed or incline during the workout routine is an experience in itself. The controls are excellent and easy to use, and the majority of customers thought the controls of the F83 were nicer than most treadmills at the gym. The bottom line: when consumers were asked whether they would recommend Sole F83 to a friend or family member, most of them said “Yes, I would recommend this treadmill to a friend or family”. The Sole F83 treadmill is of high quality and highly rated, by consumers and fitness experts. If you want a middle range treadmill that is sturdy and powerful, with excellent features, then a Sole F83 might be the right treadmill for your training.